Welome to the Cohen Religious School! It is no coincidence that the Religious School is housed in the synagogue building. 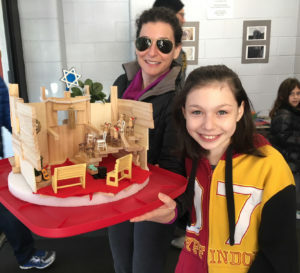 Our goal is to create a strong family connection, one where the child views the synagogue and the school within it as an extension of home. This second home is designed to provide students with an opportunity to explore and deepen their understanding of Judaism. 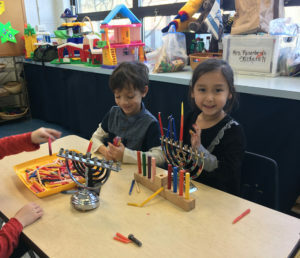 Religious School facilitates the development of the students’ Jewish identity through the study of Jewish liturgy, rituals, customs, Hebrew language, life-cycle events, Jewish holidays, and Jewish history. The academic program is enhanced by combining learning with the arts in omanut (art), musikah (music), sifryiah (library), t’nuah (movement), and bishul (cooking). Teach Hebrew words through music, games, movement and visual aids. Uncover the joys of our holiday traditions, such as eating challah on Shabbat, shaking the lulav and etrog on Sukkot or preparing mishloach manot on Purim. 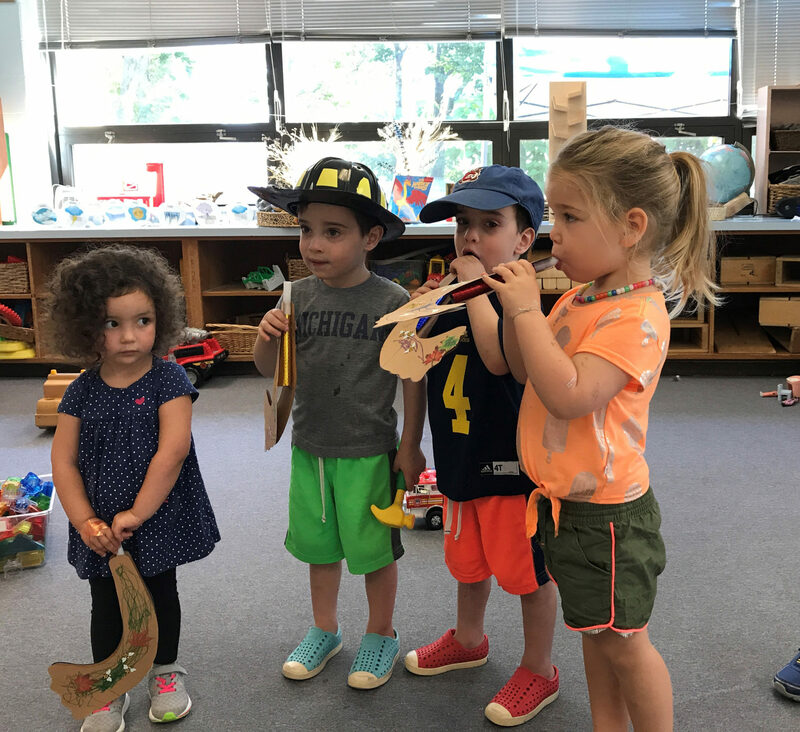 Explore Jewish holidays through songs, movement, stories, art, music, dramatic play and cooking. Discover the mitzvot by doing mitzvot and by sharing the notion that one mitzvah leads to another mitzvah (mitzvah goreret mitzvah). Memorize the basic blessings – Shema and Modeh/Modah Ani, blessings for food and for holidays. Bring learning home by involving families in home activities and family programs. Teach Hebrew words and short phrases through music, games, movement and visual aids. Impart a basic knowledge of spoken Hebrew that will provide a foundation for future study of the language using Chalav U’Dvash. This is a fun, innovative program featuring Bentzi, a Hebrew-speaking turtle puppet from Israel. Acquire basic Hebrew vocabulary, sing Hebrew songs, and memorize oral Hebrew expressions. Introduce the concept of Israel as the home of the Jewish people; connect the biblical land with the modern state; explore the country’s major cities. Explore Jewish holidays through a multidisciplinary approach integrating the holidays with art, music, drama and creative-thinking activities. Continue to explore the mitzvot by doing mitzvot and by sharing the notion that one mitzvah leads to another mitzvah (mitzvah goreret mitzvah). Continue to reinforce the basic blessings – Shema and Modeh/Modah Ani, in addition to the blessings for food and for holidays and Shabbat. Introduce Torah stories and biblical heroes. Involve families in home activities and family programs. Families should attend B’Yachad services at least twice a year. Continue to provide a foundation for future study of the language using Chalav U’Dvash. This is a fun, innovative program featuring Bentzi, a Hebrew-speaking turtle puppet from Israel. Teach basic Hebrew vocabulary, Hebrew songs, and oral Hebrew expressions. 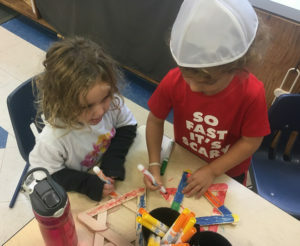 Connect Hebrew to everyday social situations related to the childrens’ experiences in the home, at school, and in encounters with friends in Hebrew. Exercise right-left directionality and learn to write their Hebrew name. Explore Jewish holidays retelling each holiday story, introducing key holiday objects, rituals and holiday vocabulary. Introduce the joy of prayers by learning the most important prayers of the Shabbat morning service. Teach Torah stories and focus on distinctive Jewish values drawn from them. Connect the mitzvot with the Jewish holidays, Torah stories and Jewish symbols. 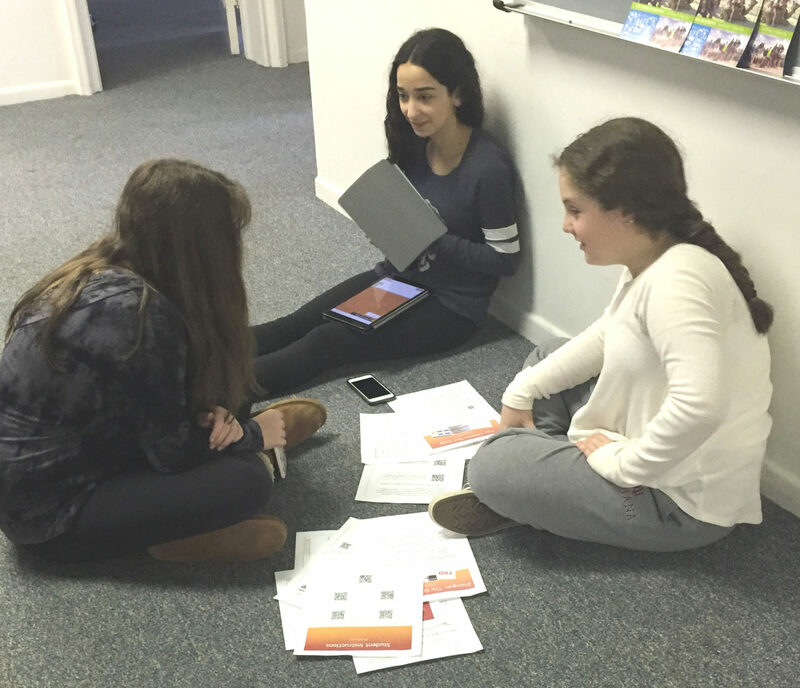 Prepare students to lead one B’Yachad Shabbat morning service. Families should attend B’Yachad services at least twice a year. Tuesday OR Wednesday 4:00 p.m. to 6:00 p.m. Develop basic literacy and decoding skills using the Tal Am curriculum and the online Behrman materials. Acquire phonological awareness, sound and structure of words, ability to divide the words into syllables, to compose a word out of separate sounds, to add a sound to a word or delete one from it, to reverse the order of the sounds. Gain familiarity with words and their forms and sounds. Identify all letters and sounds, names of letters, vowels and writing of the Hebrew letters. Develop oral expression. Emulate words spoken by the teacher. Articulate single words for the purpose of naming the environment, or naming pictures pertaining to the subject being studied. Use expressions that are frequently repeated in classroom communication within the context of the subject being studied. 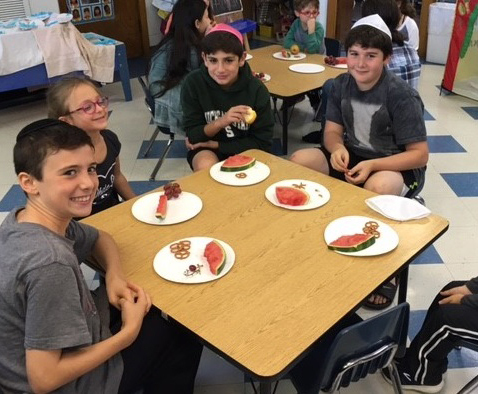 Learn the symbols, the foods, the blessings, and selected songs for each holiday in Hebrew using the Tal Am Chag Sameach curriculum. Learn to read and chant selected prayers of the Kabbalat Shabbatand Ma’ariv services (using Siddur Katan). Families should attend Kabbalat Shabbat/Ma’ariv services during the year. 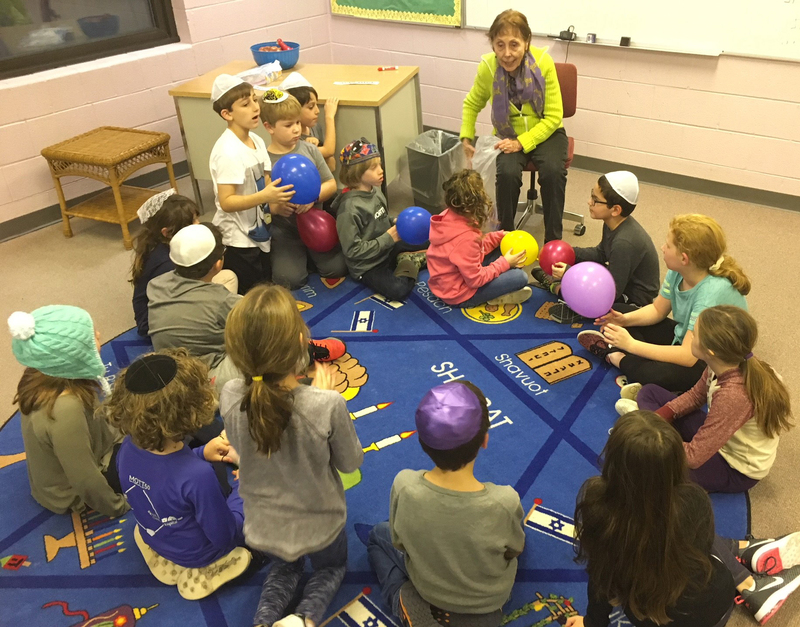 Students are encouraged to participate in Junior Congregation on Shabbat mornings. Correctly identify letters and vowels, syllables and sentences as individual words using the Tal Am curriculum. Communicate using single words, expressions and language patterns acquired in subjects studied on a regular basis. Communication is comprised of brief sentences and echoes of words spoken by the teacher on subjects studied on a regular basis. Learn to construct simple sentences in Hebrew describing the symbols, the foods, the blessings, and selected songs for each holiday using the Tal Am Chag Sameach curriculum. Read true-to-text translation of Torah stories from Genesis to Exodus. Provide opportunities to participate in biblical dialogue by reviewing classic interpretation of text and creating midrashim. Explore connections between text and core Jewish values and help personalize the Torahstories. Analyze and memorize the key Hebrew words and phrases of the Torah stories. Shabbat Family Services: Families should attend Shabbat family services four times a year. These are “learning services” meant to teach families the Shabbat morning service (for example: dissect sections of the Shabbat morning service including the main prayers, the special choreography and the Shabbat nusach). Students are required to attend one six-week chug of their liking. Read syllables and sentences with considerable fluency. Formulate communication through the arrangement and combination of words and language patterns acquired in class. Respond correctly to communication initiated by the teacher. Answer and generate simple questions. Learn to construct from simple to more complex sentences in Hebrew describing the symbols, the foods, the blessings, and selected songs for each holiday. Read and chant selected prayers of the Minchah/Havdalah service and Shabbat morning service (using Siddur Shema Yisrael). Build breadth and depth of understanding about observance of Judaism while building on prior knowledge and current experiences. 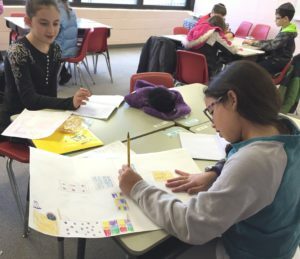 Using the 4th Grade curriculum Etgar Yesodi, students will delve into the concepts of: Zikaron: My Roots, My Memories; Brit: My Beginning, My Name; Berakhot: My Blessings; Tokhehah: Improving My Friendships; Ma’akhil Re’evim: Sharing My Talents with Others and Devekut; Developing My Relationship with God. Shabbat Family Services: Families are required to attend Shabbat family services four times a year. These are “learning services” meant to teach families the Shabbat morning service (for example: dissect sections of the Shabbat morning service including the main prayers, the special choreography and the Shabbat nusach). Read Hebrew accurately and fluently. Use vocabulary adequately to maintain a functional conversation. Respond correctly to communication initiated by the teacher. Answer and generate simple questions. Compare and contrast the different Jewish holidays in Hebrew. Learn age appropriate short stories and songs for each holiday. Lead the Shabbat morning service using Siddur Sim Shalom. (Shabbat Family Services: Families are required to attend six Shabbat morning services). Using the 5th Grade curriculum Etgar Yesodi, students will delve into the concepts of: Kehillah Kedoshah: Developing Our Classroom Community; V’Asu Li Mikdash: Creating Our Sacred Spaces; Arakhim: Living Our Values Together; Piyyutim: Connecting Our Communities Through Poetry and Song; Yisrael: A Modern Look at Our Ancient Land; Ahrayut: Our Responsibility Toward Others; A Gathering Across Z’man (Time) and Makom (Space); Developing My Relationship with G-d. Compare and contrast the different Jewish holidays in Hebrew. – Learn age appropriate short stories and songs for each holiday. Explore Jewish history from the Creation to the Expulsion of Jews from Spain. Delve into the topics of Friendship, Sifrei Torah, Kashrut and Bikkur Cholim using Project Etgar in order empower students to wrestle with questions about G-d, commandments and being Jewish. Continue learning Hebrew keyboarding skills. Lead the Shabbat morning service in the fall using Siddur Sim Shalom. (Shabbat Family Services: Families are required to attend six Shabbat morning services). Learn parshiyot of the Torah in Hebrew from the book of Shmot through Dvarim. Develop a lifetime skill of text finding, reading, and interpretation. Participate in the “My Family Story” family root project sponsored by Beit Hatfutsot. At the center of “My Family Story” is the Manuel Hirsch Grosskopf International Competition in which Jewish institutions worldwide send their young participants’ best two projects to Beit Hatfutsot. This is a chance for students to win a free trip to Israel where they join the “My Family Story” annual event and have their projects displayed in an international exhibition at the museum. See related television story: My Family Story on i24 news. Congratulations to this year’s winners Noah Hersh and Addysen Gross! Click here to see pictures of this year’s event. Wednesday 4:00 p.m. to 6:00 p.m.
Hebrew: Read short stories, newspaper articles and comics in Hebrew. Respond correctly to communication initiated by the teacher and other students. Generate questions to texts. Use Hebrew keyboarding for written communication. 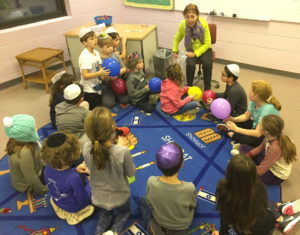 Parents and students attend joint classes on Jewish Life Cycle, Jewish Holidays according to the Talmud and important events in WWII and the Holocaust. Discuss and debate Current Events based on Jewish and Israeli weekly news. Learn 50 major concepts of Judaism and complete an assessment. History: Learn the historical events from Eastern European Jewry (late 19th century) to American Jewry today.